Good visibility is vital – If your wipers are leaving streaks of water on the windshield, or if the wiper-blade rubber shows any signs of cracking or stiffness, replace them with a new set. In addition, don’t try to use your wipers to remove adhered ice from the windshield; keep an ice scraper in the car for frosty mornings. Finally, check that all the vehicle’s lights are working properly, so that you’ll have optimum visibility at night and other motorists will be able to see you. Consider a switch to winter tires – If you drive a lot in slippery conditions, it’s a good idea to replace summer or all-season tires with a set of dedicated winter tires. These have tread patterns and rubber compounds specially designed to grip snow and ice, for optimum traction on slick roads. Keep the battery in good shape – Your vehicle’s battery is especially hard hit when the temperature plummets. Cold temperatures reduce its cranking power. In fact, at about zero degrees F, your battery only has about half the cranking power it has at 80 degrees. At the same time, the thickened oil in a cold engine makes it harder to turn over. So the battery is asked to do more while in a weakened condition. Make sure you use the right engine oil – Engine oil thickens when cold, making it harder for the engine to turn over. Check your owner’s manual for the manufacturer’s recommendation, but generally, you should be using a multi-viscosity oil that has a “W” in the viscosity index, signifying that it’s formulated for winter use. Typical formulas that are recommended for modern engines include 5W-20, 5W-30, and 10W-30, which provide good oil flow at low temperatures and can usually be used year-round. Check your cooling system – Extreme cold can cause rubber parts to become brittle and fail. Check the radiator and heater hoses for cracking, leaking, or contamination from oil or grease. The hoses should be firm yet pliable when you squeeze them. Replace them if they feel brittle or overly soft. For most vehicles, the cooling system should be flushed at least every two years (check your owner’s manual). This helps keep corrosion from building up in the system. If a flush is almost due, have it done before the cold weather hits. The system should be refilled with a mixture of antifreeze and water, typically in a 50/50 ratio. This will keep your coolant from freezing to well below zero. 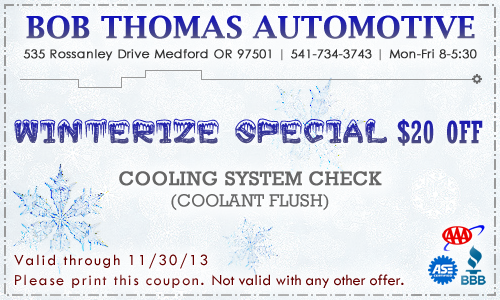 Bob Thomas Automotive is having a special for the month of November  for $20.00 off a Coolant Flush! You can find other specials & coupons on our Specials page.